The familiar characters are the property of Tolkien and his heirs. This story is written for pleasure, not profit. “The cook has made your favourite honey cakes, Eldarion, and there is fresh raspberry jam.” Arwen smiled at her son as she poured herself a cup of mint tea from the pitcher her maid had brought. For the first time, Eldarion was joining her in the solar for afternoon tea. “Thank you, Naneth.” Eldarion stood and faced the window. “But we always face the window for the Standing Silence,” Eldarion protested. “Oh,” said Eldarion. He looked utterly confused. Later that night, Arwen snuggled up against her husband in the royal bedchamber. “I am concerned about Eldarion,” she said. “No sense of direction!” Aragorn sat up abruptly. “My son has no sense of direction?” His thoughts went back to a young Ranger lad he had tried to train many years ago. The boy had been able bodied, willing, and skilled with sword and bow, but he had been capable of getting lost almost anywhere since he completely lacked any sense of direction. After he had almost led his fellows into a swamp, when he had gone South instead of North, Aragorn had concluded that there must be something ailing his brain. He had taken him aside and suggested he was better suited to the life of a farmer than that of a Ranger. Surely, Eldarion, his own flesh and blood had not been born with such a handicap? “You need to take guards with you too,” Arwen said firmly. “It is too much of a risk to go unaccompanied.” Arwen’s tone allowed no argument. The sun shone brightly the next week when Aragorn, Faramir, and a very excited Eldarion set off for their camping trip. Aragorn had decided that they should camp out on the wooded lower slopes of Mount Mindolluin. Two guards trailed discreetly behind the small party. As they rode, Aragorn pointed out various sights to his son, carefully emphasising what direction he should look in. When they made camp for the night, Aragorn continued the lesson. “We will get a good view of the sunset, here, ion nîn. The sun always sets in the West and rises in the East. Tomorrow we will get up early and watch her rise. “It is good the sun rises each morning, is it not?” Eldarion said thoughtfully. “So why do we speak of the East as if it is bad?” Eldarion sounded puzzled. “Sauron once dwelt there and he was very bad indeed,” said Aragorn. Both Aragorn and Faramir were silent for a moment pondering the question. “History is boring!” said Eldarion. “Maybe our preference for the West lies with the wind,” Aragorn said hastily before Eldarion could inform them in great detail why history bored him so much. “The wind?” Eldarion’s attention was caught. Eldarion burst out laughing and Faramir smiled. “We are fortunate that the wind is in the West tonight,” said Aragorn. “It is gentle wind that feels like a caress against your hair. See the way the leaves are blowing?” He pointed towards a nearby branch. Eldarion intently studied the swaying leaves. The three sat in silence watching the pink and gold tipped clouds scudding across the scarlet orb of the setting sun. They then settled down for the night and Eldarion was soon sound asleep, nestled snugly between his father and the Steward. “But did he take it in?” said Aragorn. “We still have no idea whether the boy has any sense of direction or not. Tomorrow, I will show him my lodestone.” He yawned. Faramir had already fallen asleep and within moments, Aragorn was slumbering too. Eldarion was the first to awaken and swiftly roused his father and the Steward. “She is waking,” Eldarion insisted. “Look in the East!” He pointed a small finger towards the faintest sliver of light on the Eastern horizon. Aragorn smiled proudly, his weariness forgotten. “It’s magic!” Eldarion exclaimed as he watched the needle quiver and then settle. “It always points to the North,” Aragorn explained. Aragorn was momentarily taken aback. “North comes first when we talk about directions,” Faramir said. “We use the North Star to guide our travels at night and sailors use it to help find their way at sea.” Aragorn shot him a grateful look. “What other star helps guide travellers at night, ion nîn?” Aragorn asked. “The Star of Eärendil!” Eldarion exclaimed, bouncing in excitement at knowing the answer. “I like fish,” said Eldarion. Aragorn returned his lodestone to his pocket wondering if his son’s mind was more focussed on food than finding the trail. They quickly broke camp and set out on their way. Aragorn continued to point things out to Eldarion as they rode along the trail. The sun climbed higher in the sky and her rays penetrated the woodland canopy. Birds sang in the treetops. Aragorn’s spirits soared. It was a perfect day to be out in the wilds. Faramir’s contented expression showed that he felt likewise. Aragorn started to sing an old Ranger song and Eldarion and Faramir joined in. Faramir then started a lively drinking song from his days as a Captain, changing some of the words to make them suitable for Eldarion’s young ears. The three continued lustily as they rode on their way until they reached a stream where they paused to refill their water bottles and let the horses and Eldarion’s pony drink. Aragorn suddenly realised that he could not hear the guards. The men had struggled to remain unobtrusive, especially as both were City born and bred. They crashed through the forest like a pair of mumakil. He reined in his horse and turned to Faramir. “Have you heard our guards in the past hour?” he asked. The only answer was the twittering of the birds. Aragorn strode back up the track and re-joined his son and his Steward. “That is about a league back,” said Aragorn. He remounted Roheryn. They urged their horses and the pony to a canter and rode back towards where the path forked. It was not long before they came across two riderless horses grazing in the undergrowth. “The guards’ horses!” Faramir exclaimed. Just then, they heard a loud groan. Rounding the bend in the path, they came across Maglor and Caranthir in the middle of the track. Caranthir was groaning and holding his head while Maglor was supporting him. Aragorn and Faramir dismounted and hastened to the side of the guards. “What has happened?” Aragorn demanded. Caranthir’s only answer was another groan. “Why didn’t you try to get on your horse and come for help?” asked Faramir. Aragorn knelt beside Caranthir and started to examine his head. “Look at me!” he commanded. Not long afterwards, the party began their way back to the city. 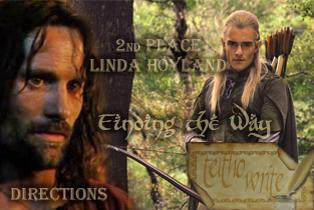 Aragorn rode ahead with Eldarion while Faramir and the two guards made up the rear. The Steward kept a close watch on the injured men. They groaned every time the horses jolted them on the rocky trail. “I thought soldiers were brave,” said Eldarion. “No, but I shall send them both for extra training,” said Aragorn. He knew Caranthir had an old grandmother to support while Maglor had a wife and infant daughter. He would give them another chance. Maybe the recruits nowadays were not spending enough time training in the wilds. “I thought guards were supposed to look after us?” said Eldarion. So can I be a Ranger when I grow up then?” Eldarion said eagerly. A/n. This story was written for the Teitho “Directions” contest where it was placed second. Inspired by a discussion with Deandra.